Tonight, Pittsburghers will be reminded of their place among the luckiest of all sports fans. In addition to the talented individuals we've had the privilege of watching over the years, we've also been treated to some amazing rivalries. In the past 12 months, we've experienced victorious conference championships over the equally reviled Ravens and the Flyers. The fact that our teams came out on the winning end was the equivalent of getting the perfect present on Christmas morning as a kid. It was pure elation. What lies ahead beginning tonight will be a hotly-contested rematch with Philadelphia, another city that's been able to celebrate a major sports championship in the past year. Call it the Battle of Pennsylvania or any other cute moniker you choose to use, but it's going to be must-see TV. We're already watching Pittsburghers trash talk the Flyers on their daughter's Philadelphia-based television show, and the series hasn't even started yet. Imagine what's going to happen once goals are scored, checks are thrown, gloves are dropped and fans get creative. it's going to get interesting. 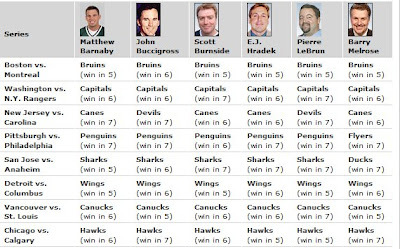 The ESPN experts are largely picking the Pens in seven in this series, with only Barry Melrose as the anti-Penguin holdout. The PensBlog previews round one with a Bill Simmons-esque playoff manifesto and goes with the Penguins to hoist their third cup. Yahoo's Puck Daddy blog is going with the Pens in six, as per their in-depth series preview, which covers every angle from nicknames to pests. Four of five FanHouse writers are picking the Penguins. And hockey writer James Mirtle has the Pens winning the whole enchilada. Bob Smizik points out the team's 18-3-3 record since the Dan Bylsma hiring and thinks the Pens take round one in six. And Four Sports Illustrated writers are not only picking the Pens to win the series, but to win the East. That's encouraging. As for yours truly, I'm going with the Penguins in six. The Flyers are very talented at certain spots, especially on special teams. 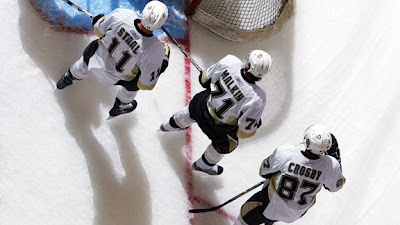 Like the Pens, they've had some level of playoff success in the recent past. And they definitely have players that can find the net, such as Jeff Carter, who lit the lamp 46 times this season. On the other hand, the Pens are hot at the right time, which is usually a formula for success going into any sport's postseason. Their struggles this season were largely due to injuries of players who've returned or the disappointing performances of players no longer here. And they are as talented at the top of their roster as any team in any sport. The Flyers can resort to their tired plan B of thuggery if things go wrong, but by that point, they'll probably roll over like they did last year. Bettman was there to witness Hartnell's thuggary. He should be suspended.